Sign-up to our newsletter for a CHANCE to win. A weekend tailored for those of you who are just starting your mountain biking journey or are looking to develop more confidence on natural trails. We will show you some basic trailside fixes, what to put in your backpack and give you some tips and tricks for riding off road. The riding will be beginner level but far from boring. Expect a reasonable amount of challenge and of course some fairly decent climbs. 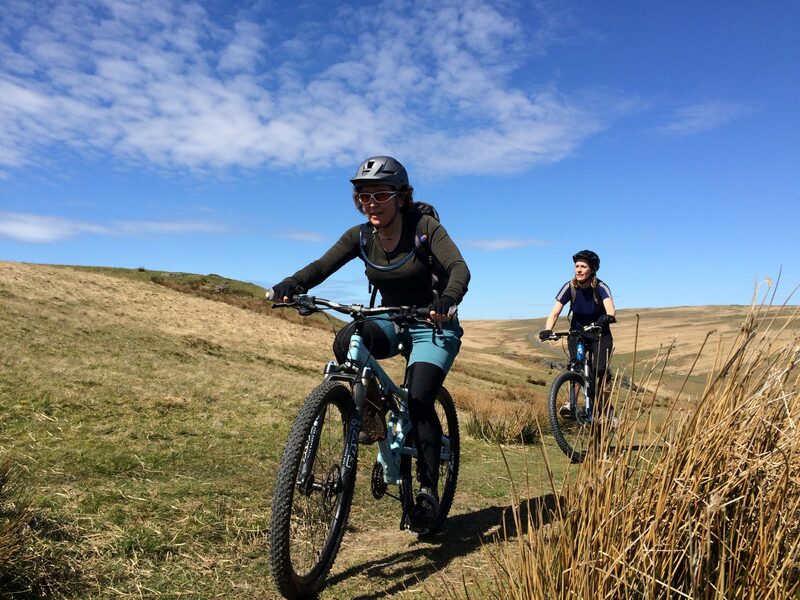 Our aim is not to beast you, but two days of riding in Wales does require a certain level of fitness – the trails we will be riding will go up as well as down! This weekend is about enjoying some lovely trails in the beautiful, quiet and wild Elan Valley. We want you to leave feeling inspired to get out and ride more wherever you live. With a wealth of experience of teaching all different levels of ability and with a bike specific focus Polly’s yoga sessions will both enliven and relax. The morning sessions are dynamic but always start gradually before getting you energised for the day. The post ride sessions are a more relaxing affair with plenty of long held stretches to release any tension in the body from our ride. No previous yoga experience needed. With the Elan Valley on the doorstep we can ride straight from our venue. Using a combination of cycle path, natural bridleways and tracks both days, the terrain will be suitable for beginners being mainly non-technical (think long grassy descents and wide tracks). We will be out for approximately 3-4 hours on both days and will ride through woodland, open moorland and next to the Elan Valley reservoirs. We will be doing some fairly big climbs (this is Wales after all!) so expect some challenge over the weekend but remember that its okay to do a bit of pushing up the hills. Day one will cover around 25km and Day two comes in a little shorter at around 20km. Non – Yoga partners welcome! If you fancy coming with your partner and he or she doesn’t want to participate in the Yoga that’s fine by us. We can also give more challenging route options for partners to self guide if they want to go big. Get in touch with us if you have any questions. Is this weekend for me? We always aim to pitch things to suit peoples abilities but also to offer some challenge too. That way you are more likely to enjoy the weekend rather than just trying to survive it! This weekend does require a fairly reasonable level of fitness so if you rarely do any exercise this might not be the best event for you. However if you are booking months in advance you do have time to start getting some regular exercise into your week. Swimming, walking, cycling are all things that you can do to up your fitness. 2 Course Evening Meals on Friday and Saturday night . A choice of full breakfasts or porridge/muesli/toast. Packed lunches Saturday and Sunday. Two days of riding with qualified guides. Four Yoga sessions over the weekend. Alcohol – there is a well stocked honesty bar at the venue. Q: Can I drink alcohol on the weekend events/retreats? A: In some venues there is an honesty bar and on our weekend yoga retreats we do serve wine with dinner. We neither encourage nor discourage drinking alcohol as we see it as a personal choice. Q: Do you cater for special diets/vegan/gluten free? Q: Is there wifi/phone reception? A: In most of our venues we have limited phone reception and wifi. We see this as a rather good thing, giving everyone time to switch off and unplug. Q: Can I have a single room? A: In Elan Valley lodge everyone can have a single room if they wish. At some of our other venues the rooms are shared twins. We do have some single rooms available with a supplement. See individual events pages for details. A: Firstly you don't need to go out and spend lots of money on expensive kit. It is good however to have a decent waterproof (especially in Wales!) and a decent helmet. You can wear trainers or old walking boots/shoes and use a small backpack for carrying food and drink. It's good to have gloves and some warm layers, sometimes we will be out on the hills and even in summer the temperature can drop. We carry bike tools, first aid kits and group shelters so you only need to bring what you need for the day. It is helpful to have spare inner tubes that fit your bike. If you are hiring then we provide these. Q: Will I be the slowest person/won't everyone get tired of waiting for me? Q: How long are the rides each day? A: On the beginners weekend we aim to cover 25km the first day and around 20km on day two. This might take us all day but we like to take in the scenery too. On the non beginners weeekends we typically cover 35-40km each day. Doesn't sound much? There's plenty of big climbs to make up for that! Q: Can I hire a bike if I don't have one? A: Yes - we can arrange bike hire. Q: I'm a complete MTB beginner, will I cope? A: The beginners weekends are aimed straight at you so you should be totally fine although we will offer sufficient challenge throughout the weekend to enable you to progress and gain confidence. The non beginner weekends can be fine for beginners too but the fitness requirements are a bit higher. That said if you approach the weekend with a positive attitude and a willingness to give it a go we think you might have a great time! Q: Do I have to attend all the yoga sessions? A: You can attend as many or as few of the sessions as you wish. Q: What type of yoga will we practice? A: I teach Hatha yoga with a emphasis on Vinyasa Flow. This is a freestyle form of yoga where poses are linked together with the breath to form flows. It's not necessarily fast but it is strong and dynamic. There will also be elements of Yin and Restorative yoga included. Q: My balance is terrible, why is that? A: It's very common to struggle with balance, especially if you are just starting out on your yoga journey. The best approach is to not worry too much about it. Don't focus too hard on trying to balance and definitely don't worry if you fall over. Focus on keeping the breath nice and steady and stay relaxed and with practice you will improve. Q: Isn't yoga just about sitting and meditating? A: Meditation is an aspect of Hatha yoga, however there is much more to yoga than sitting in the lotus position. We use a strong physical practice along with specific breath techniques to tap into our focus and concentration. We see this practice as a form of moving meditation. Q: Are the yoga sessions suitable for beginners? A: Yes! The sessions are tailored to be accessible for most people with plenty of options for more or less challenge. If you do have specific limitations or an ongoing condition or injury do get in touch to discuss. Q: I'm not flexible at all, can I still do yoga? A: Yes! You don't need to be flexible to practice yoga. The practice itself will improve range of motion, strength and flexibility so being stiff is all the more reason to start. …that I wish my whole life was this weekend on a constant loop! Riding and yoga in a really approachable, inclusive, safe feeling environment. You create an amazing atmosphere of challenging yourself but with no pressure, and that people of mixed abilities can all enjoy equally and get something from. All in beautiful surroundings and super relaxing. New bike or new skills? Mountain Yoga Breaks © 2019. All Rights Reserved.